One year later, it feels like we are fighting a rising tide of hate released by the Conservative Party of Canada. I remember exactly what was happening a year-ago as news about the terrorist attack at a Quebec mosque was happening. Along with a group of community organizers with whom I work, I was getting play-by-play updates of the aftermath of the murders of: Azzeddine Soufiane, 57; Khaled Belkacemi, 60; Ibrahima Barry, 39; Mamadou Tanou Barry, 42; Abdelkrim Hassane, 41; and Boubaker Thabti, 44. I remember feeling a complex mix of terror, anger, rage, fear and worry for my children, my family and the community. The last Conservative government buoyed by Republican politics in the United States stirred up the racism and hate that continues to live and thrive in the silent politeness of our historic and current Canadian landscape. While everyone was talking about the shock and surprise, many of us in our hearts knew that it was only a matter of time. Now what? Mourners listen during funeral services for three of the victims of the deadly shooting at the Quebec Islamic Cultural Centre, at the Congress Centre in Quebec City, on Feb. 3, 2017. I couldn't sleep that night. I kept looking at my phone for updates, worrying about the men, women and children who would have been there. We weren't safe anymore in what was supposed to be a sanctuary for us. I went to work shell-shocked, with this fog over my head and heart. I could see life happening but it all felt surreal. What was worse was I don't think anyone around me really realized what was happening and how much trauma I was walking in with that day. I felt reassured that the Prime Minister labelled it what it was — a terrorist act — and I was hopeful after his majority win that perhaps there would be a change. Public outpouring of love and support helped. In many conversations within the community, we wondered if this could be a turning-point for us as a country, or would it simply return to what it was? A narrative, wrapped in a rhetoric of fear and terror, where we were the "other," simply "coming here" to destroy, needing to shed our identities and prove our loyalty and patriotism. Certainly those beliefs and attitudes were buoyed by laws like the Cultural Barbaric Practices Act, C51, Security Certificates and all the other laws that have made who we are non-Canadian or not Canadian enough. Today though, one year later, it feels like we are fighting a rising tide of hate released by the Conservative Party of Canada, and that not much has really changed. The Quebec attack was not prosecuted as an act of terror. In spite of the 253 per cent rise of Islamophobic hate crimes since 2012, the Muslim community continues trying to convince the police to investigate these acts as hate. A Motion to address Islamophobia unleashed hatred across the country in ways that continue to scream "you do not belong here," and these were being echoed by people elected supposedly to represent all of us. Except "us" apparently excludes some. Most recently this re-surfaced in the vitriolic responses around an 11-year-old child who claimed she was attacked. The onslaught of hatred on the eve of the anniversary of the Quebec terrorist attack has led to the Muslim community feeling further isolated. Muslims continue to be targeted by laws put in place by the Conservatives. Today we see the potential deportation of Abdoul Kadir Abdi, who's faced the worst forms of systemic Islamophobia and racism. There has been a rise in hate inspired and white nationalistand supremacistgroups, including Canada's first armed militia who wants to shed blood to protect Canada from Muslims. All of this is happening and the government still has not even acknowledged, "white supremacy" as being an issue in spite of CSIS having documented the concerns, nor have they mentioned any type of public safety strategy, policy or approach to address this. In Quebec, where the attacks took place, the rhetoric of fear and terror re-emerged after the crocodile tears of politicians around the niqab. The Prime Minister initially said the federal government couldn't comment. In Ontario, we are still waiting to see what the Anti-Racism Directorate will do to address Islamophobia, supposedly a priority. Many of us continue to hold our breath, wondering when laws might change or tangible support will come. There have been some glimmers of light. Since the attack, the Coalition Against White Supremacy and Islamophobia was formed and mobilized nationwide rallies and events in an effort to increase awareness and dialogue. Jewish-Muslim relationships continue to be strengthened, as Jews, who know all too well what complacency in the rise of white supremacy can lead to, and Muslims, have begun to outreach to one another. Labour and community based organizations and neighbours have been showing solidarity. Many Muslim-Canadians are beginning to speak openly and unapologetically about who they are, and not needing to choose one part of their identity over another. These are the moments many of us hold on to for hope. In Toronto, Councillor Neethan Shan, who brought forward a motion to make Jan 29 a Day of Remembrance, has faced a backlash of hate. The National Council of Canadian Muslims has asked the Prime Minister to consider doing the same for the country, just like we did and should have, after 14 women were killed at a university in Montreal. 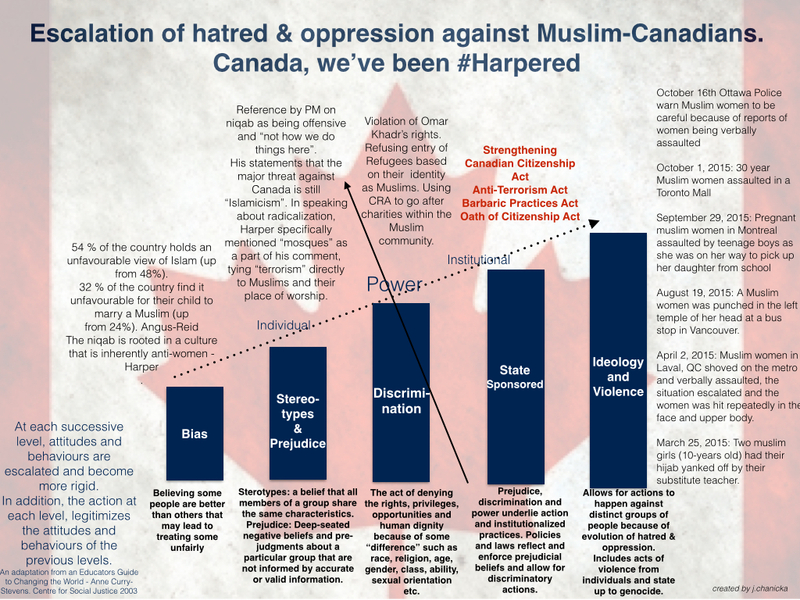 The question has now become, are Muslims, "Canadian enough" in the eyes of those in power to afford to us what has been rightfully done for others, or will politicians pander to hate and privilege at our expense? Until then, I'm trying to deal with all the trauma, pain and heartbreak that Jan 29 stirs for me, the tears that I have already begun to cry and the silence and the lack of awareness of this reality by those around me. I think about the families and those 17 children who are without their fathers. What is the legacy that their lives have had on our country? How might they see that the lives of their fathers made us better people and a better country? We need more than words and assurances. We need action.